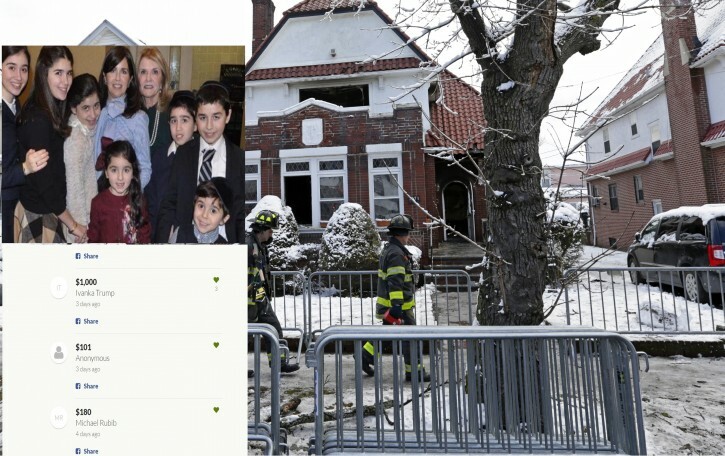 Brooklyn, NY - A campaign to build a family center in memory of seven Midwood siblings who perished in a devastating fire in 2015 has received a donation from one of the biggest names in New York City: Ivanka Trump. Trump made the $1,000 donation in her own name several days ago to The Sassoon 7 Project which is currently live on the GoFundMe website. As previously reported on VIN News (http://bit.ly/2hralmR ) , the effort is being spearheaded by Mrs. Gayle Sassoon as a legacy for her children Eliane, David, Rivkah, Yehoshua, Moshe, Sara and Yaakov who died in March 2015. Trump’s representatives did not respond to inquiries regarding her donation but Heather Fallas, a cousin of Mrs. Sassoon who posted the campaign to the crowdfunding site said they were elated to receive Trump’s donation, According to DNAinfo.com. More than $126,000 has been raised for the center over the past 18 days. Any yukel can post their name as "Ivanka Trump", and then the rest of the yukels go to town with the news, and contact the Trump administration. Hilarious. I read vosizneias when I'm bored. Thanks for reading my comment. I hope it makes the news.